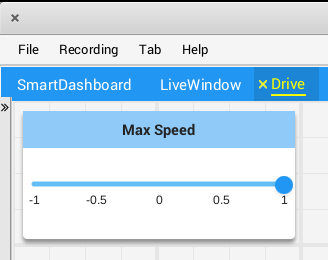 Robot programs can specify exactly which widget to use to display a data point, as well as how that widget should be configured. As there are too many widgets to be listed here, consult the docs for details. 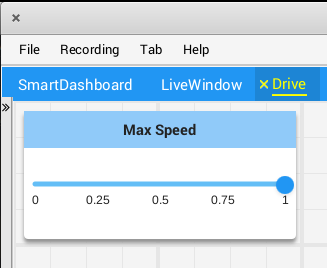 In this example, we configure the "Max Speed" widget to use a slider to modify the values instead of a basic text field. Widgets can be specified by name; however, names are case- and whitespace-sensitive ("Number Slider" is different from "Number slider" and "NumberSlider"). For this reason, it is recommended to use the built in widgets class to specify the widget instead of by raw name. However, a custom widget can only be specified by name or by creating a custom WidgetType for that widget. Widget property names are neither case-sensitive nor whitespace-sensitive ("Max" and "max" are the same). Consult the documentation on the widget in the BuiltInWidgets class for details on the properties of that widget.